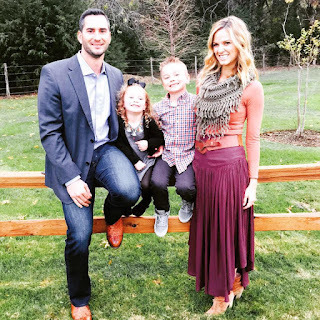 Justin Marshall Ruggiano was born April 12th, 1982 in Austin, Texas. The six foot one outfielder, attended Texas A & M University playing for the Aggies baseball team. He was drafted by the Los Angeles Dodgers in the 25th round of the 2004 draft. He has been a journey man in the big leagues playing for the Tampa Rays (2007-2011) Miami Marlins (2012-2013) Chicago Cubs (2014) Seattle Mariners (2015) Los Angeles Dodgers (2015) Texas Rangers (2016) & New York Mets (2016). In addition he has played parts of 12 seasons in the minor leagues with 125 HRs & a .292 batting average there in 907 games. He has also played winter ball & in the 2007 World Baseball Classic for Team USA. He hit a HR in that years competition, although Team Italy beat Team USA for the first time in 21 years. His best years were in Miami when he was a full time outfielder, in 2013 he played in a career high 128 games with 18 HRs 18 doubles 15 stolen bases 50 RBIs while batting .222. It was big drop off from the previous year when he hit .101 points better at .313 in just 91 games. His season was cut short that year, after injuring his shoulder in a game against the New York Mets. Post Season: Ruggiano got to the World Series with the 2008 Rays, getting to play the field on a historical when Rays manager Joe Maddon placed him from right field to playing him directly behind the second base bag as a fifth infielder. In 2015 he was traded to the Los Angeles Dodgers on the trade deadline, for a player to be named later. He played 21 games for the NL West Champion Dodgers, batting .291 with 4 HRs & 12 RBIs in 21 games (55 at bats). 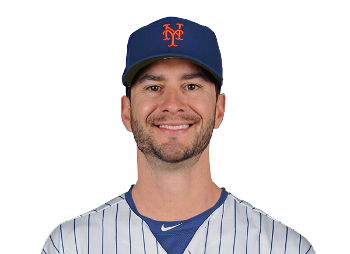 2016 NLDS: He made three appearances in the 2015 NLDS against the New York Mets, getting the start in Game #4 at Citi Field, getting replaced in the 6th inning. Overall he was 0-4 in the series, striking out three times against Mets pitching. He started out 2016 with the Texas Rangers but was designated for assignment after just one game. He played at AAA Round Rock & then was signed by the New York Mets in July, starting out at AAA Las Vegas. 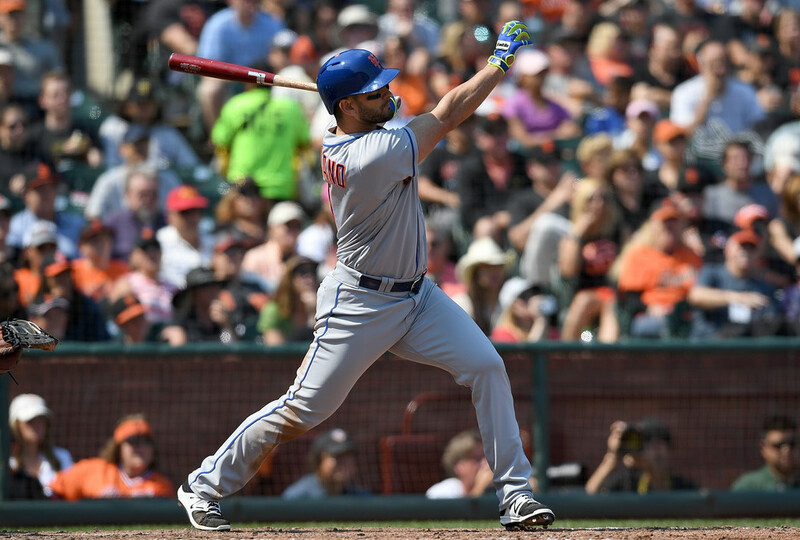 On July 30th he made his Mets debut replacing the injured Jose Reyes on the roster. He got a hit in his first Mets game as well. After three games he went on the DL too, joining a whole bunch of injured Mets that season. He returned on August 18th & hit a grand slam off Madison Bumgarner in a 9-5 Mets win at San Francisco. They sure could have used that in the Wild Card Game six weeks later. 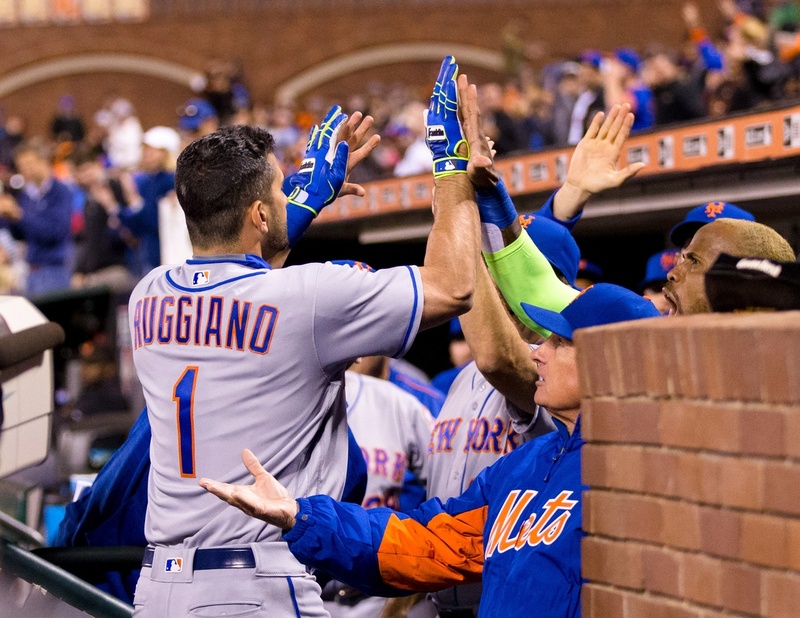 Ruggiano added another HR on August 25th, in the Mets 7-4 win at St. Louis. Unfortunately he strained his shoulder at the end of August & was done for the year. 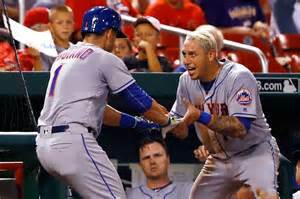 In eight games for the 2016 Mets he hit .350 with 2 HRs & 6 RBIs. In his eight year career he has 330 hits 51 HRs 71 doubles 159 RBIs & 39 stolen bases in 464 games with a .322 on base %. Family: Justin & his wife live in Heath Texas with their children.